Purdue University’s College of Veterinary Medicine has been awarded a $3.18-million grant from the U.S. Department of Health and Human Services to expand access to the veterinary profession for individuals from disadvantaged backgrounds and address the need for more rural/food safety veterinarians. The Vet Up! National Health Careers Opportunity Program (HCOP) Academy for Veterinary Medicine will address the national shortage of veterinarians in public health and rural/food animal practice in the state and beyond, as well as the lack of underrepresented individuals entering the veterinary profession. Vet Up! will leverage the university’s history of diversity programming and partnerships with high schools as well as historically black colleges, universities, and state entities to design and deliver curricula that provide otherwise-inaccessible opportunities to students. Purdue’s Evaluation and Learning Research Center will assess the impact of the programming on participants and the veterinary profession. Vet Up! College is a summer immersion program to prepare undergraduate students to competitively apply to a veterinary medical degree program. Vet Up! 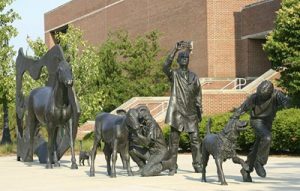 DVM supports Purdue veterinary medical students throughout their professional degree program and prepares them for careers in veterinary shortage areas.